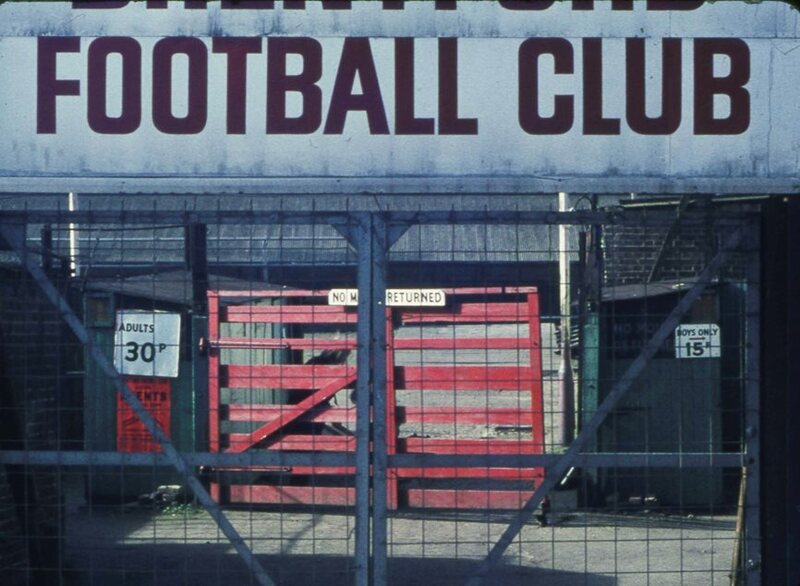 Peter Young took this photo outside the Griffin Park gates on 4th March 1972, towards the end of the successful 1971/2 season: BFC was promoted to the Football League Third Division after finishing third (thanks, wikipedia. Tickets were priced at 30p for adults and 15p for boys (no suggestion that a girl might attend). In contrast a ticket to the first home match in the 2017/18 season is priced at from � for adults and �for juniors. Do the gates survive? They must have had a lot of coats of paint if so. The site has over a dozen photos of football teams including Brentford FC but also various school and church teams, some dating back to the early twentieth century; either search on 'football' on the home page or work through the photos of people section or school photos section. There is also an index of Brentford's sporty people which includes some of the BFC players as well as many other sportsmen and women. Full list of Peter's photos.